They say to grow a loyal following you should make your content as relative and specific to your target audience as possible. In an effort to meet this criteria I ran a Twitter poll last week. The question was simple. If you had to make a choice between a foam roller or a barbell (with plates) for the rest of your playing/training career, which would you choose? These types of questions provide me with important information in regards to where I should meet my audience in terms of depth. In my opinion, the answer to this question should be an easy one for anybody with a small level of training knowledge. I must remember however, that while some questions and concepts seem simple to me / some of my followers, there are others who aren’t quite so sure. Hopefully I can produce content that gives you an understanding of important training principles, and how you can apply them to improve your golfing body. As always, my goal will be to try and convey the information in a way that is easy to understand, and provide some take aways you can use immediately. The results of the poll are a little disappointing, but the bright side is that I should be able to help a lot of golfers improve the physical readiness of their bodies for better golf (and everyday life). Cutting to the chase, the correct answer is the barbell. I have been referring to my “5 Pillars of Golf Strength and Conditioning“ that underpin being “Fit for Golf” a lot recently. If we take a look at the impact each implement can have on the 5 Pillars we see a clear picture of why the barbell is the winner. In the table above I give the foam roller credit for being able to improve one of the five pillar’s, mobility. On the contrary, I argue that a barbell can be used quite successfully to achieve a training effect in all 5 categories. This is obviously down to how each implement is applied, but even so, the barbell is much more versatile. This takes up less than 5% of my clients training time. While my opinion may be based on education and experience, it is still an opinion. Luckily the people at strengthandconditioningresearch.com (SCR) do an excellent job of pooling together actual scientific research to give us objective information. Looking at the body of research on foam rolling we can see it improves flexibility acutely, i.e if you do it before a workout, you will have greater range of motion when you begin the workout. It also improves flexibility chronically, i.e do it for a few weeks and your flexibility is improved in general, not just immediately after you foam roll. The mechanism by which it works is unclear, but according to the boys at SCR it has to do with muscle activity patterns, and it is not the same as how stretching works. Strength training on the other hand is well known for and has been shown to improve strength, power, flexibility, muscular endurance, and muscle mass. All good news for increasing club head speed and reducing likelihood if injury. There is a misnconception that strength training leads to a loss in flexibility or mobility. This is simply not true, and the research is there to prove it. I think people feel that as soon as they start lifting weights they will turn into the steroid fulled body builder they see on TV or in the magazines. 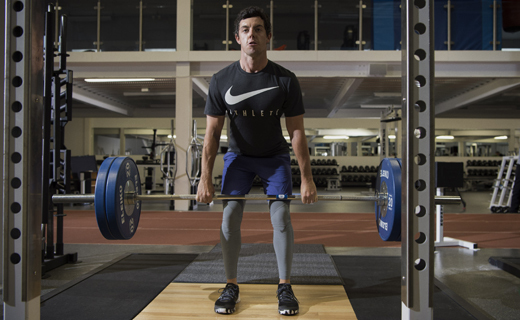 It’s important to remember there is a very important distinction between training for improved golf performance, and building muscles that are as big as possible. This is not what strength training for golf is about. 10 years of heavy barbell training later. When the scientific evidence, and the practical experience of strength & conditioning coaches is pooled together there is only one winner in the debate, and that is the barbell. Far more important than the barbell is what it represents however, which is strength training, i.e training your muscles to produce more force over time. If we do this strength training with a selection of intelligent exercises, through a full, safe range of motion, and with attention to detail in regards the technique it is a wonderful training modality for everyone. The abundance of benefits derived from appropriate, intelligent, strength training cannot be replaced, and should be enjoyed by all golfers, and people in general. This is absolutely not to bash foam rollers or soft tissue work in general, they are excellent tools for working on mobility. It’s just that when compared to the very diverse barbell & strength training, they can’t compete. I think there are two main reasons why so many people voted for the foam roller. One is that strength training is perceived as dangerous because of the absolute nonsense that is talked by TV commentators, mainly in relation to Tiger. The other is that strength training is hard, and because of that many people shy away from it. It takes time to learn how to properly control your body under a heavy load, and it requires effort to actually do the work. t’s tiring, it reminds you how out of shape you are. The weight doesn’t lie, and always provides an objective measure of your strength. Foam rolling on the other hand is fairly easy. Maybe some slight discomfort but nothing compared to the feeling of pushing out the last rep of a split squat or bracing every muscle you can to keep your posture during a heavy deadlift. Fit For Golf 12 Week Online Training Options. You can avail of 20% off for a limited period, by entering FFG20 in the coupon bar at checkout.